Uber now allows you to make free calls to your cab driver. 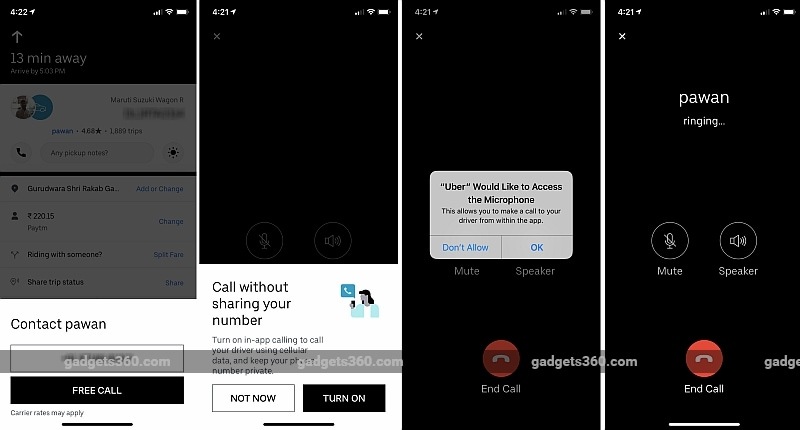 The feature, which uses VoIP (Voice over Internet Protocol) to enable voice calls through the Uber app, was announced globally back in October last year and it is now being rolled out in India. You'll still be able to make regular voice calls using the cellular network, like before. Uber India confirmed Gadgets 360 that the new feature is being tested as a pilot. Uber users in India started reported on Saturday evening that they are seeing the VoIP calling feature. Gadgets 360 was able to independently verify the rollout of the new feature on both Android and iOS versions of Uber's app. To make a free call to your Uber driver, tap the calling button after booking your cab and then hit the Free Call option from the pop-up screen. The Uber app will ask you to grant permission for accessing the microphone of your device. Once the permission is granted and a call starts, you'll see a screen featuring the name of your driver along with a call timer. The calling screen also includes dedicated controls to mute the audio or turn on the speaker. You can, of course, tap the End Call button to end the active VoIP call. When you make a VoIP call through the app, your driver won't be able to see your name and your phone number, with the caller simply identified as "Uber". Same will be the case when your driver makes a VoIP call to you. However, it's also cost effective and especially useful especially if you're travelling abroad and don't have a local SIM or international roaming. The feature is also helpful for drivers as they can easily call their riders without leaving the Uber app. "The new feature is quite convenient as I can speak with my Uber driver using a public Wi-Fi hotspot even when my phone isn't getting the [cellular] network," Shruti Malhotra, a rider who regularly takes Uber cabs for going to her office in Gurugram, told Gadgets 360. As we mentioned, the free call feature was first announced globally last year, and the feature is now available in India as well. The feature is presently limited to the Uber cab service and isn't available for other services by the company like Uber Eats. "Using the new feature, Uber can even record our conversations," says Pawan Kumar, an Uber driver who got 10-12 calls through the new VoIP addition even on day one. "We earlier refuse to go to some destinations on calls, but with the new feature, Uber might use the recordings of our conversations with the riders to understand whether we have refused the ride or the ride has been refused by the rider." When we tried using the new feature for the first time by making an in-app VoIP call to one of our Uber drivers, it wasn't answered. "I didn't attend your call as I thought it was someone from the Uber team who called me and it would take some time on the call to listen to their concern," said Manoj, the driver, adding that the company hasn't yet provided any details about the change that appears to emerge as an Uber call on the screen. "Uber India is testing a pilot which allows riders and drivers to make calls using their data network to each other through the app as a VoIP. Currently this is operational in Pune, Mumbai, Hyderabad, Delhi NCR, and Bangalore. The feature was announced last fall, and is already available in many countries," an Uber spokesperson said in a statement emailed to Gadgets 360. Leveraging the latest change, you can start making free calls to your cab driver with the latest version of the Uber app on your smartphone.